If someone were to offer you a week-long, all-inclusive holiday to one place in Greece, where would you choose to go? Would it be Santorini? Mykonos? Any island with those iconic white houses slowing descending into turquoise seas? These places are probably the first destinations I would choose to go…or would’ve chosen to go if my friends had not introduced me to the beauty of the Peloponnese. I was recently inspired by a post I came across in my WordPress Reader by The D&M Adventure Life. The post listed and described some lesser-known, but just as beautiful Greek Islands (click here to see the post). Along the lines of The D&M Adventure Life’s post, I want this post to share a hidden gem with the world – one whose beauty and perfection as a vacation destination may, at times, seem unjustly overshadowed by the more popular Greek islands (or Greek islands in general). I visited Greece for the first time over a year ago (I booked a round trip in and out of Athens and stayed with Greek friends from the capital city). Though my experiences in Greece played a huge role in motivating me to start this blog, I never actually blogged about my weeklong adventure in the country. A year ago, I was the not-so-proud owner of a point-and-shoot. And even though I brought this point-and-shoot on my holiday, it stayed at “home” on beach days. Since five out of seven days were beach days, 90% of my photos were taken with an iPhone 4. As someone who likes to devote quite a bit of time to photography and takes pride in sharing higher quality photos, the haphazardly-taken iphone 4 photos didn’t come close to reaching my “photography expectations.” Truly, they haven’t magically managed to self-edit, evolve or whatnot within the last year to reach my expectations on this day. I simply decided that it was too selfish to keep the Peloponnesian coast to myself, and the jaw-dropping beauty of the place manages to shine through even in the iPhone 4 pictures (…I hope). 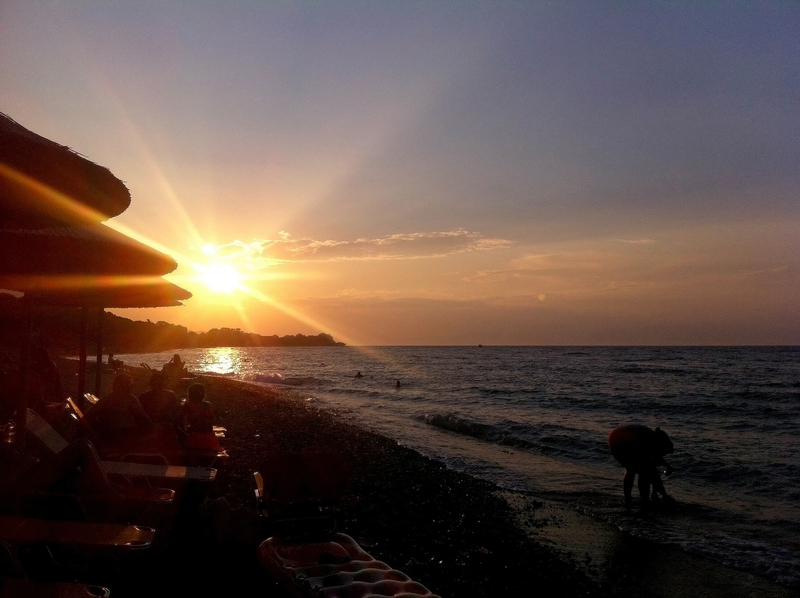 A beach in Sykia. 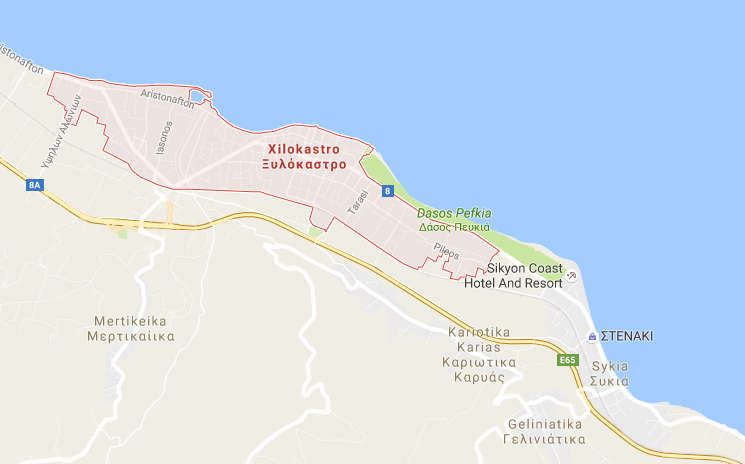 Not be confused with the Sikia found closer to Thessaloniki (see map at the end of the post for reference). Close-up of colourful wavy seas. 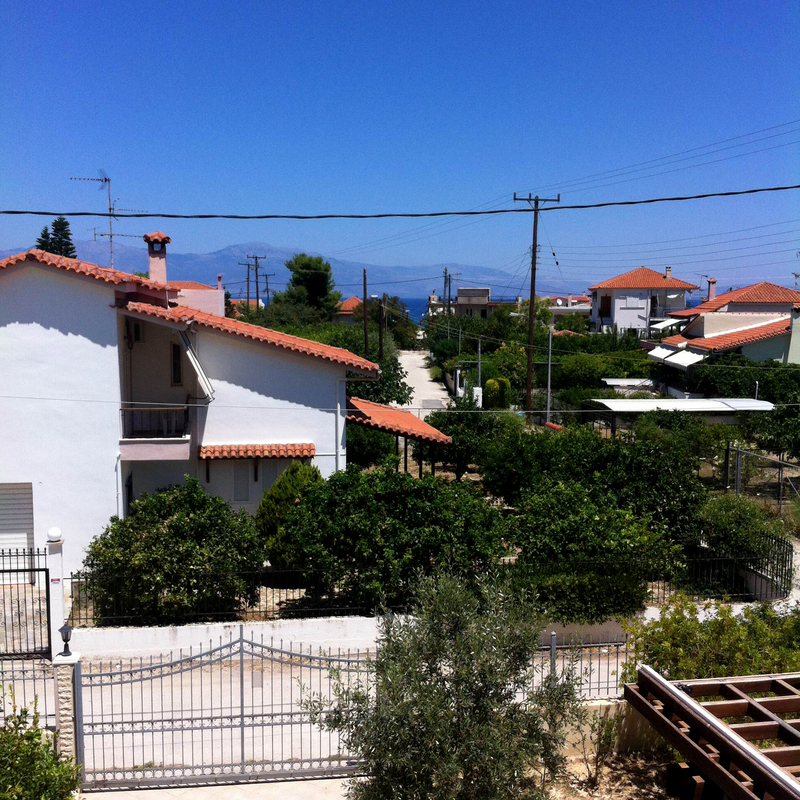 For over 4 days, my friends and I stayed in one of their family’s summer homes located a 10 minute walk from the beach and inbetween the towns of Sykia and Xylokastro. After a finishing my crazy first year as an NQT abroad, those lazy beach days were exactly what I needed. 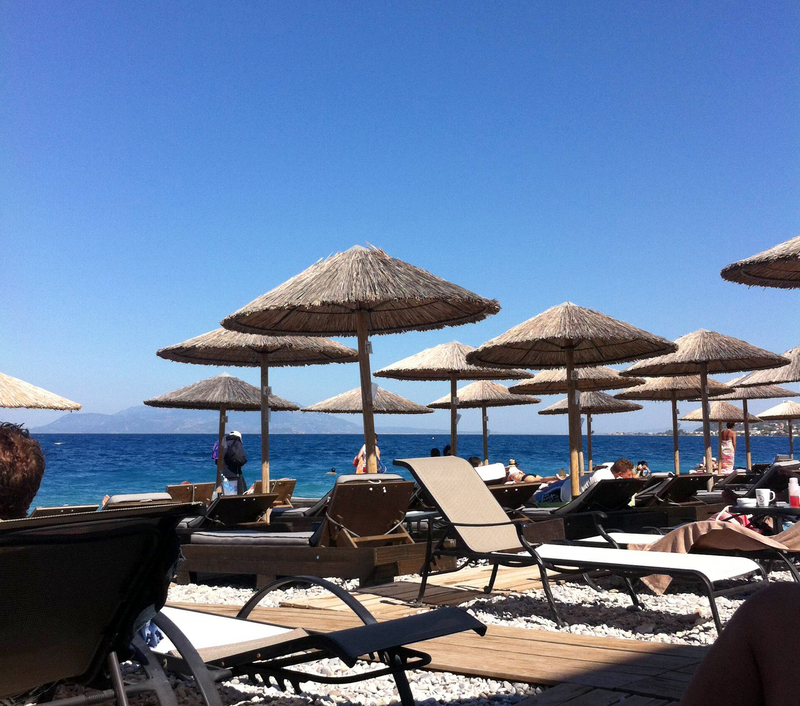 During the day, we spent our time lounging at many of the different beach bars operating along the coastline. These places are open during the summer months and offer customers a variety of drinks (alcoholic and non-alcoholic), food, tables, sun beds, and access to volleyball or tennis courts. Of course you have to pay for the food and drinks, but most of the time, using the sun beds and courts during the week is completely free (there is a small charge to use these facilities on summer weekends since many people visit the towns then). Considering that most days were hotter than 35 degrees, spending the days by the sea (and in the sea) was necessary. View from one of the beach bars. Another day, another beach bar. Just to reinforce what’s been shown in the photos, the beaches were absolutely beautiful. The water was always a bright shade of turquoise and clear (except on a couple of wavy days…but that’s to be expected). The sun shown every day and was determined to scorch everyone until they reached a nice barboni shade (barboni is a red fish eaten in Greece). It feel that it’s important to note that the beaches weren’t sandy – they were made up of soft, small round pebbles – so when getting into the sea, it was best to get right in. However, jumping straight in wasn’t a problem, because that’s all you wanted to do when simmering in 35 degree weather. Enlarged cover photo. Missing those captivating turquoise seas right now. In the evenings, we would head off to either the town of Sykia or Xylokastro (Sykia is a great deal smaller than Xylokastro). There, we would indulge on delicious foods. We nourished ourselves on everything from authentic souvlaki to calamari, fried saganaki cheese, olives, melitzanosalata, and mastic liquor. Dinner was at least a 3 hour affair. 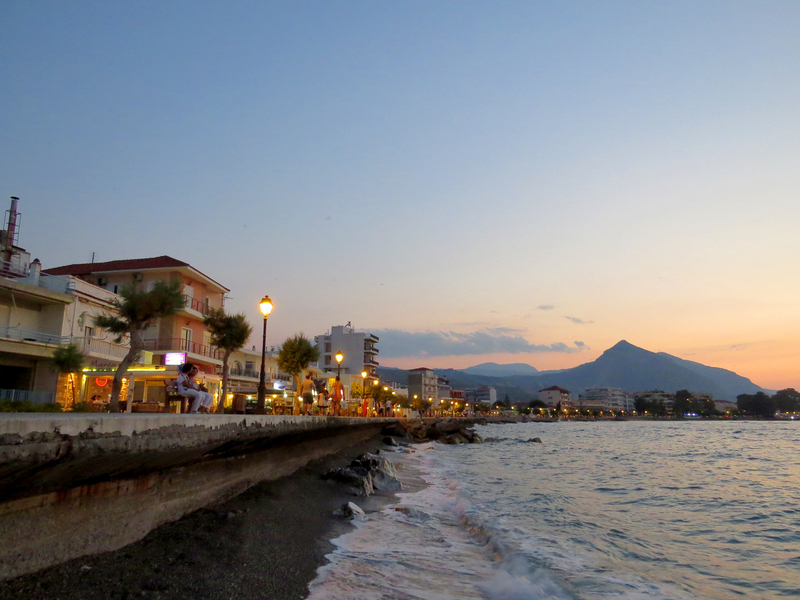 Overall, if you’re looking for a relaxing evening, you can take a stroll along the boardwalks in Sykia or Xylokastro. You can also walk through the lovely Pefkia forest path right by Xylokastro before it gets too dark. The hum of cicadas fills the forest. However, if an adventurous night out is on your mind, definitely head to Xylokastro. Many bars and clubs that stay open into the early morning hours can be found along the boardwalk. Though, I must warn you, if you’re not Greek, you may end up having a once-in-a-lifetime kind of experience. Hours of many of the sets in the clubs are dedicated to Greek pop – old and new alike. It’s absolutely fantastic and is a key ingredient in creating a night to remember…forever. Don’t knock it until you try it! Just to give you a bit of a geographical and historical overview, driving from Athens to Xylokastro will take a maximum of two hours. The town is known as a bit of a vacation town. It is also a 30-45 minute drive away from the larger city of Corinth. The modern-day Corinth takes its name from ancient Corinth which once stood only a couple of kilometres away from contemporary one. Unfortunately, an earthquake in the 19th century shattered the original city. Nevertheless, the ruins of Ancient Corinth can still be accessed today. As well, Xylokastro is located on the very same peninsula ancient Sparta was found on. For our convenience, I’ve added in maps of southern mainland Greece and a small area of the Peloponnese (pinpointing Xylokastro) below. Ultimately, if you’re looking for an affordable and beautiful vacation getaway during the summer months, I cannot recommend Xylokastro enough (underrated and not so well-known to the global community often leads to more reasonable prices)! Of course, I do hope to set foot in the Greek Islands one day (I still want to experience them). However, this area of the Peloponnese fulfilled all my expectations when it comes to going on holiday in Greece. It gave me the tlc I needed to be recharged for another working year (and I’ve been to Cuba, Jamaica, and Punta Cana, so you can trust my claims about vacation destinations). 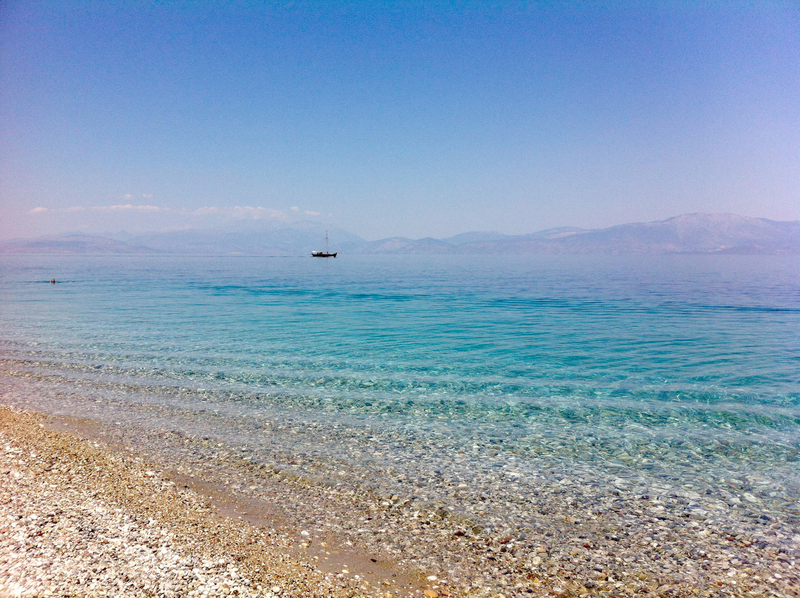 Thank you for reading, and I hope to see you on the beaches of Xylokastro one day! Sunset in by the sea. I completely agree! I know a friend of a friend who has never left Greece because he says there is so much to see and explore in his own country. Well Greece has a lot to offer as a destination (some other time you could visit north Greece, completely different landscape), much much more than it’s well known islands and mousaka, but I wouldn’t go that far … the world is a wonderful place and I intent to explore it as much as I can! I’m almost sure that people who say they will explore their own country first and then visit another they do neither.Curiosity about what’s outside your doorstep is the first step to great adventures and important discoveries. I will make sure to do that when given the opportunity! I generally have the same feeling as well when it comes to exploring. Overall, it’s incredible how diverse 1 single country in Europe can be. I feel like Poland is another country that is full of diversity and surprises. It’s such a bonus to have local friends who can show you the lesser known places, it looks beautiful, you didn’t need to worry about your photos! Thank you for the compliment! I’ve found that one of the best ways to make these kinds of friends is through hostels. Love the sea, so beautiful colours! The pics are still gorgeous – even though it’s iPhone 4. Somehow, they have this film quality look to them now. Strange right? We just took a week in Naxos – def my favourite beach in the whole world. Still in the Cyclades, but without the tourist trash vibe of Santorini and Mykonos. Reasonable prices, still mostly Greek families, and absolutely delicious food. Ahh, I wish I was still there! Thank you so much for the compliment! And also, thank you for the tips! I will definitely look into those islands. So beautiful 🙂 thanks for sharing! I love mainland Greece, it’s so underrated! 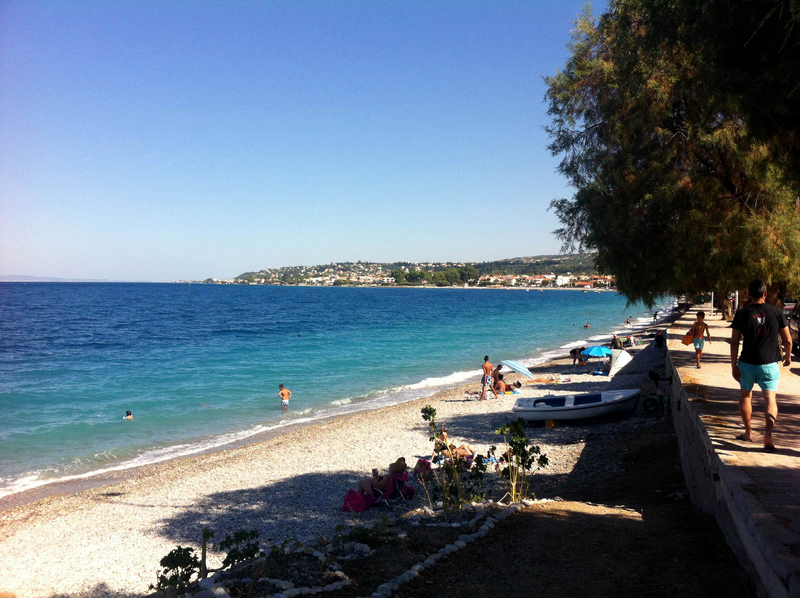 I stayed in Koroni on the south coast for 6 weeks last year and absolutely love it! It sounds like you had a great time, and the photos are great! Thank you for the comment and compliment! Just looked up Koroni and it looks incredible. I will have to go one day. Yes you should! It’s a great place!